I used to love the knowing looks butchers would flash my way when I would ask for beef bones, chicken carcasses or offal. I once received a marriage proposal after requesting three pounds of oxtail. Rather, I think the butcher told my boyfriend, who was with me at the time, to ask me to marry him right away. ‘Put a ring on that,’ may have been the exact words. You get the point. That was at least four years ago when I first started making my own stocks and needed to ask butchers for things like chicken carcasses. Those days are pretty much over. It seems it is no longer uncommon for someone to make their own stock or request lesser known cuts of meat. This, in itself, is a good thing. I love that the food revolution has carried quality product and more homemade—fewer processed—ingredients into the kitchen of your average home cook. However, if I am being totally honest, I miss the knowing looks. And the marriage proposals. One key thing I have learned about stocks at The French Culinary Institute, is that any kitchen without veal stock is an ill-equipped one. On occasion I have the opportunity to bring home from school a quart container of veal stock, or excess demi glace (veal stock that has been reduced by half), but last week I found that all of my reserves had been used up. It is getting cold here in New York and I am going to need a freezer full of stocks to accommodate all of the soup and stew making I have planned for the coming weeks. Unfettered by the lack of butcher attention received in recent years, I set out last week to gather the ingredients for a batch of veal stock. Though not a difficult task, veal stock is slightly more complicated than the chicken or vegetable stock I make. Since I make a brown veal stock, I have to roast the bones and mirepoix before leaving everything to gently simmer on the stove for hours. Still, considering what a difference using a homemade stock makes in the final flavor of many, many dishes, the effort is minimal in relation to the payoff. The recipe included below does not need to be followed exactly (I try to use up whatever vegetable trimmings I have stashed in the freezer when making stock), but a good guideline is to aim to include mirepoix (carrots, onion, celery) equivalent to about 20 percent of the weight of bones being used. So, for my seven pounds of veal bones, I included about one and a half pounds of mirepoix. Once the stock has simmered for roughly eight hours, cool it down quickly by breaking it into smaller containers and chilling them over an ice bath. Once cool, place the containers in the fridge if you are planning on using the stock in a day or two. Otherwise, store them in the freezer for the next soup, stew or braise you make, all of which can benefit from a little homemade stock flavor. Place a heavy bottomed roasting pan in the oven to preheat. Coat the veal bones in oil and place in the pan. Roast the bones for 30 minutes then turn the bones over and continue roasting for 30 more minutes. Toss the carrots, onions, celery and leek greens with the tomato paste and add them to the roasting pan for the last 15 minutes of cooking (after the bones have been roasting for 45 minutes). Place the roasted bones and mirepoix in a large stockpot. Deglaze the roasting pan with some water to loosen the browned bits, scraping them up if necessary. Add the water and browned bits to the stockpot along with the tomato trimmings. Add cold water to the stockpot until the bones are fully submerged (about 6 quarts of water depending on the pot) and bring to a boil. Reduce the heat to a simmer and skim well. Add the tomatoes, garlic and bouquet garni. Continue to simmer for eight hours. It should be a very low simmer with just a few bubbles breaking the surface every few seconds. Continue to skim the surface while the stock is simmering. Removing the scum that floats to the surface will result in a clear stock - a sure sign of success in a finished stock. After the stock has simmered for eight hours, strain it and place in smaller containers to cool over an ice bath. I plug up my sink and fill it with an ice and water mixture. I then pour the stock into metal bowls and place the bowls in the ice bath to cool. Pour the cooled stock into quart containers and freeze or place in the refrigerator for later use. Although...buying a pig's head still gets you plenty of attention, just in case you are ever feeling lonely for some butcher love. I'm going to try your recipe. Rob and I made the French Laundry veal stock once and we almost killed each other. I'm thinking yours might save our marriage should we ever attempt to stock our fridge with this delectable staple again. 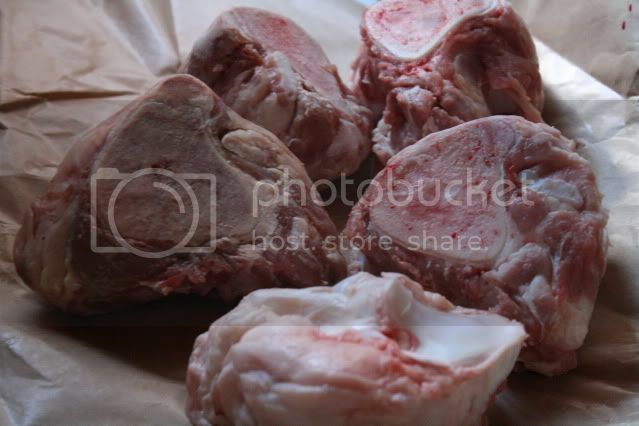 One of the great consternations of living in France is the bizarre lack of bones for stock making - when you ask the butcher for some, he more often than not will give me a look like I just dropped in from another planet. Doesn't stop me from keeping a small supply of stock in the freezer at all times, though. :) Happy Thanksgiving! I've always wanted to make my own stock. I constantly think about it and make a note that next time I have some spare time I will make a whole batch of chicken stock and then vegetable stock and now I'll add to that list veal stock. But it's thanks to your post that I finally did get around to making my first ever batch of stock. It wasn't veal though, it was vegetable stock. It's such an easy thing to make and so key to cooking that I don't know why I haven't done it sooner. I will be making veal stock next. Thanks! At first look I thought that was strawberry butter! Hahah. Looks delicious. Love your blog but wish you posted more. The raviolis with egg I made a while back and they were INSANE!! I'm an American expat living in France and I write about food/recipes and more recently champagne trips after readers asked me to help them plan after living in Reims for 1 year. Hi there, I just discovered your blog tonight, and I was very excited to read through all of your entries! I'm a novice in the kitchen, but recently I have been trying to make my own stocks. I was wondering what your opinion is of using a crock pot to simmer the bones/vegetables, rather than using a stockpot on a stove. Is there any major difference? As you say, simmering, not boiling, is very important because too much heat will cause the bones to 'melt' and make for a cloudy stock with a cloudy taste. Also, skimming as you go is essential. Modern cooking, at least in Europe, has given up on veal and beef stocks because they are too heavy and rich. Chicken stock, with roasted carcass, is much more versatile and lighter. There's no point in adding garlic and cooking for 8 hours - it will just disappear. After straining it is a good idea to let the stock settle for several hours so that the residues sink to the bottom. You can then pour off the liquid leaving the bits behind. It will give an even clearer stock. If you reduce the stock down (you boil gently) to concentrate, you can then put it into small bottles or an ice tray which takes up much less space in the freezer and is much handier to use later.